The Holy First-Martyress and Equal-to-the-Apostles Thekla was born in the city of Iconium. She was the daughter of rich and illustrious parents, and moreover she was distinguished by extraordinary beauty. At 18 years of age they betrothed her to an eminent youth. But having heard the preaching of the holy Apostle Paul about the Saviour, Saint Thekla with all her heart came to love the Lord Jesus Christ, and she steadfastly resolved not to enter into marriage, but rather to devote all her life to preaching the Gospel. The mother of Saint Thekla was opposed to her daughter's plans and demanded that she enter into marriage with the bridegroom betrothed to her. Saint Thekla's fiancee likewise made a complaint to the governor of the city against the Apostle Paul, accusing him of turning his bride against him. The governor locked up Saint Paul in prison. During the night Saint Thekla secretly ran away from her house, and she bribed the prison guards, giving them all her gold ornaments, and so made her way into the prison to the prisoner. For three days she sat at the feet of the Apostle Paul, hearkening to his fatherly precepts. The disappearance of Thekla was discovered, and servants were sent out everywhere in search of her. Finally they found her in the prison and brought her home by force. At his trial the Apostle Paul was sentenced to banishment from the city. And with Saint Thekla they again began urging her to consent to the marriage, but she would not change her mind. Neither the tears of her mother, nor her wrath, nor the threats of the governor were able to separate Saint Thekla from her love for the Heavenly Bridegroom, the Lord Jesus Christ. Her mother in a insane rage demanded from the judges a death sentence against her unyielding daughter, and Saint Thekla was sentenced to burning. Without flinching, the holy martyress went into the bon-fire and made the sign of the cross over herself. At this moment the Saviour appeared to her, blessing her present deed, and inexpressible joy filled her holy soul. The flames of the bon-fire shot up high, but the martyress was surrounded by an halo and the flames did not touch her. Thunder boomed, and a strong downpour of rain with hail extinguished the bon-fire. The torturers scattered in fear. Saint Thekla, kept safe by the Lord, quit the city and with the help of a certain Christian youth searched out the Apostle Paul. The holy apostle and his companions, among which was also the Disciple Barnabas, were hidden away in a cave not far from the city, praying fervently, that the Lord would give strength to Saint Thekla in her sufferings. After this, Saint Thekla went together with them preaching the Gospel in Antioch. In this city she was pursued by a certain dignitary named Alexander, who was captivated by her beauty. Saint Thekla refused his offer to enter into marriage, and so for being a Christian she was condemned to death. Twice they set loose upon her hungry wild animals, but they would not touch the holy virgin, but instead lay down meekly and licking at her feet. The Providence of God preserved the holy martyress unharmed through all her torments. Finally, they tied her to two oxen and began to chase after her with red-hot rods, but the strong cords broke asunder like cob-webs, and the oxen ran off, leaving Saint Thekla unharmed. And the people began shouting: "Great is the God of the Christians!" The governor himself became terrified, reasoning it out finally, that the holy martyress was being kept safe by the Almighty God, Whom she served. He then gave orders to set free the servant of God Thekla. With the blessing of the Apostle Paul, Saint Thekla then settled in the desolate surroundings of Isaurian Seleucia and dwelt there for many years, constantly preaching the Word of God and healing the sick through her prayer. 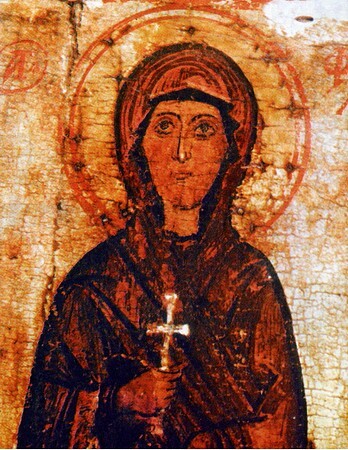 Saint Thekla converted many pagans to Christ, and the Church names her worthily as "Equal-to-the-Apostles" ("Ravnoapostol'na"). Even a pagan priest, seeking to assault her purity and punished for his impudence, was brought by her to holy Baptism. More than once the enemy of the race of man tried to destroy Saint Thekla through people blinded by sin, but the power of God always preserved this faithful servant of Christ. When Saint Thekla was already a 90 year old woman, pagan sorcerers became incensed at her for treating the sick for free. They were unable to comprehend that the saint was healing the sick by the power of the grace of Christ, and they presumed that the virgin-goddess Artemis (Diana) was her especial patroness. Out of envy against Saint Thekla, they sent their followers to defile her. When they had already approached quite close to her, Saint Thekla cried out for help to Christ the Savior, and the hill split open and hid the holy virgin, the bride of Christ. And thus did Saint Thekla offer up her holy soul to the Lord. Holy Church glorifies the "First-Suffering" Thekla as "of women the glory and guide for suffering, opening up the way through every torment". From of old many a temple was dedicated to her, one of which was built at Tsargrad (Constantinople) by the holy Equal-to-the-Apostles Constantine (Comm. 21 May). And then too, the name of the First-Martyress Equal-to-the-Apostles Thekla, a prayer intercessor for the ascetic, is remembered during the tonsure of women into monasticism.